Often, when the history of Fort Wilderness is discussed the longtime friends of the campground lament the loss of River Country, Discovery Island, and, of course, the Fort Wilderness Railroad. 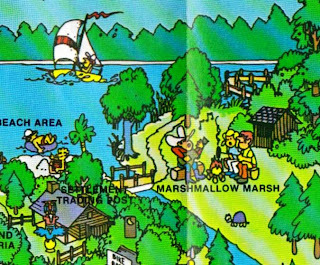 What is less often remembered or grieved for is the Marshmallow Marsh Canoe Excursion. Perhaps this amnesia is due to the presence of another, more central-located, campfire sing-a-long. It couldn’t hurt that this other production also included a classic Disney film. The Marshmallow Marsh Canoe Excursion set out from the Meadow Trading Post Dock in canoes through Fort Wilderness’ meandering waterways, eventually pulling up to a campfire setting at the edge of Bay Lake. Along the way, like all gifted Disney host and hostesses, the canoe guide would offer little known facts about Walt Disney World, trivia questions, jokes, and a few well placed songs (such as the rarely remembered “Marshmallow Marsh Song,” which was easy to pick up as you went along as it was sung to the tune of “She’ll Be Coming ‘Round the Mountain”). Once at the Marshmallow Marsh, guests were not only treated to a sing-a-long, but they also had an excellent viewing location for the Electrical Water Pageant and were able to view the Fantasy in the Sky fireworks (the predecessor to Wishes) before beginning the paddle home to the Meadow Trading Post Dock. For a better idea of just where the canoes would lead you, here is a section of Fort Wilderness Resort map from 1978: Whether for drawing crowds away from the Meadow’s area sing-a-long and film, or because guests no longer wished to indulge in the physical activity of paddling to and from a sing-a-long, the Marshmallow Marsh Canoe Excursion was discontinued in the 1980s. For a while, the area could still be seen from the Wilderness Swamp Trail which has, alas, also been mostly swallowed back up by the swamp and the wilderness. In what could be one of the last acknowledgments of this area, an event taking place at Fort Wilderness as part of the Disney Girl Scout Spirit Days is listed as the “Mystery of Marshmallow Marsh,” though the specific location(s) for this event are unknown. As much as I would love to ride the rails around Fort Wilderness once, take a launch out to wildlife refuge, or visit the old swimmin’hole, I would be just as likely to jump at the chance to paddle down the river with a merry bunch of campfire enthusiasts. Thank you! I haven't heard about this before. I love Fort Wilderness; it's our home away from home! So I appreciate learning this piece of its history. I wish I had the chance to do this now. We are going to WDW for the first time since 1997, taking my two young ones (5 and 2). I went often in the 70s and 80s as a kid. I fondly remember the Canoe excursions, River Country, and Discovery Island. They will all be missed.